Noahpinion: Why don't Americans value social insurance? Why don't Americans value social insurance? People believe they paid for programs such as Social Security and Medicare. They put in contributions each month, the government saves that money somewhere, somehow, and when they use these programs they aren't consuming from "government," they are consuming their own contributions. Thus, I believe the people answering this question are actually answering whether they've consumed services they didn't pay for in one way or another. The answers reflect the fact that most people believe that anything they get out of the system is far less than what they put into it (though in many cases that isn't actually true). So it's true that people want the budget cut, but only the parts where people are forced to pay for "underserving" recipients of these government services. "Yeah," he says, "but I don't make very much." This Tea Partier isn't against government spending. He's not even against class-based income redistribution; in fact, it sounds like he'd be right at home in Sweden! But he's adamantly against people receiving government benefits unfairly. There is a need for social insurance...high moral character is not enough to protect you from the vagaries of the market system. One day a job can be gone, morals or not, savings can evaporate as a result, and all those years of doing the right thing -- putting a little away each month for the future -- provides little protection against financial ruin when there are no jobs to be found. But for some reason, conservative Americans don't see that kind of insurance as something that they might ever need. Why not? I submit that a lot of it has to do with democracy's ultimate bogeyman: tribalism. From the mid 70s through the mid 90s, America saw a massive and highly effective conservative campaign against anti-poverty programs. This campaign portrayed welfare recipients as being primarily black (remember "welfare queens"?). Of course, in reality, most American welfare recipients are white, since most Americans are white. But lots of people bought into the "welfare is for black people" trope, because of the base rate fallacy, and because of another commonly held stereotype: namely, that black people are lazy. Any hard-working white American, the conservatives told us, could find a new job if (s)he got laid off. The only reason you'd ever need social insurance is if you're lazy, and whites aren't lazy. And after all, why would you want universal insurance if you think that you're of a type that never gets sick? Americans support helping the poor and are willing to support social programs that do not directly serve their own class interests; however, they are averse to supporting welfare because they believe that it primarily benefits African Americans and that African Americans lack a suitable work ethic. White Americans believe that the majority of welfare recipients are black, even though the majority are white, because the news media consistently portray images of African Americans when reporting on poverty and welfare, Dr. Gilens points out. And to make matters worse, sympathetic stories about poverty are more likely to feature white families while critical stories more often than not focus on African Americans. 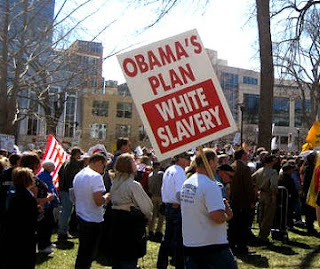 By convincing large swaths of white America that only "those lazy blacks" would ever need welfare, Republicans convinced their base to stop seeing welfare as insurance and to start seeing it as lump-sum racial income redistribution (motivated, perhaps, by liberal white guilt). Few conservatives try to hide the fact that they believe something along these lines. After all, Rush Limbaugh and Glenn Beck both explicitly called health care reform "reparations." In fact, I might go so far as to say that the entire post-Reagan conservative movement is held together by the bedrock assumption that "government spending" is synonymous with "taking money from whites and giving it to underserving blacks (and perhaps Hispanics)." Every prediction of a crackup between libertarian "business conservatives" and authoritarian "social conservatives" has been wrong. The glue that holds the movement together is the fact that taxes (which business conservatives hate) go to fund the government spending that social conservatives equate with race warfare. America, with its polyglot immigrant background, just doesn't tolerate the welfare state that European and East Asian countries enjoy. That Tea Partier Taibbi met would be at home in Sweden...but Sweden we ain't. So how are we going to fix this? Luckily, tribal identity is not fixed forever; there is evidence that, over time, national identity can overcome ethnic identity. And it's happened before, right here in America; Polish, Greek, Italian, and East European immigrants, once stigmatized, have by now been absorbed into the great mass of "whites." It sounds weird in this day and age, but I firmly believe that there's no reason Americans can't start to believe in an "American" tribe that cuts across all racial lines. But unless and until we do manage to forge an American national identity, or somehow manage to disabuse people of the "lazy blacks, hardworking whites" stereotype, I'm just not sanguine about our hopes for getting real social insurance. We live on the same chunk of rock, yet that doesn't transcend racial identity. Fraternities may, but those aren't at a high enough abstraction to apply to everyone. Before asking people to be American, we must first answer "What does it mean to be American?" Overseas immigrants may know this best. They gave up their chunk of rock and their past for that Element X, after all.